In 2018, 192 corn hybrids representing 24 commercial brands were evaluated in the Ohio Corn Performance Test (OCPT). Four tests were established in the Southwestern/West Central/Central (SW/WC/C) region and three tests were established in the Northwestern (NW) and North Central/Northeastern (NC/NE) regions (for a total of ten test sites statewide). Hybrid entries in the regional tests were planted in either an early or a full season maturity trial. These test sites provided a range of growing conditions and production environments. As producers are planning their seed needs for next year, it is important to think about acreage, hybrids, and seeding rates. Finding the best corn seeding rate is important for efficient production, but the “optimum” corn seeding rate – the one that maximizes profitability – can vary within and among fields with small differences in soils and weather. The annual Northwest Ohio Corn & Soybean Day is scheduled for Friday, January 19th in Founders Hall at Sauder Village in Archbold from 8:30 a.m. to 4:00 p.m. The program has a variety of speakers, a farmer/retailer re-certification credits and nearly 30 exhibitors sharing information on management practices for the 2018 crop production season. This year’s Corn/Soybean Day offers the three-hour Pesticide applicator re-certification (CORE, 1, 2, 6) plus one hour of re-certification for fertilizer applicators (15) as well as 4 hours of Certified Crop Advisor (CCA) credits. The Farm Science Review will be held again this year at the London, Ohio location. Dates are September 19, 20 and 21. See http://fsr.osu.edu for more information. Harvest has not quite stared yet so you should have the time to check in. The Agronomic Crops Team (http://agcrops.osu.edu) will once again be welcoming visitors on the east side of the grounds between the parking lot and the exhibit area. Abnormal Ear Diagnosis Poster, ACE-1. Farmers frequently encounter abnormal corn ears in their fields when the crop has experienced a major stress, such as drought, temperature extremes, disease, insect injury, or misapplied chemicals. These abnormalities often affect yield and grain quality adversely. 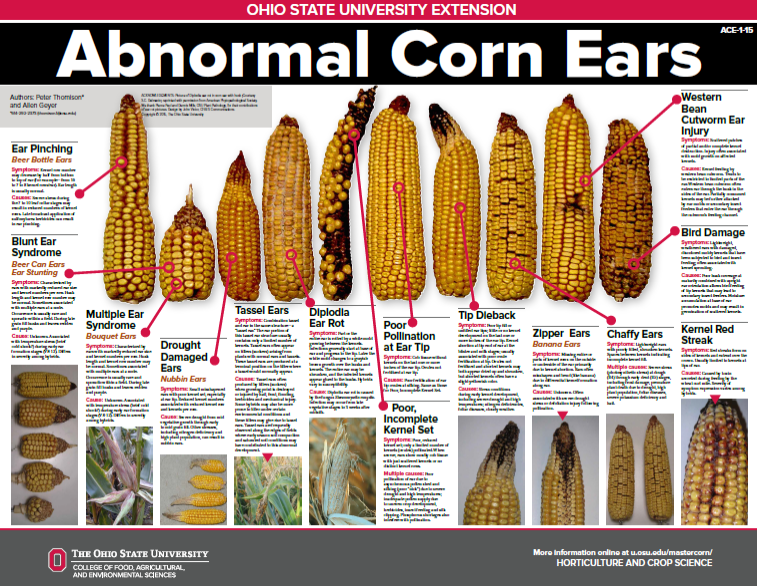 In this poster, ten abnormal corn ears with distinct symptoms and causes are highlighted. Corn Disease Management in Ohio, Bulletin 804. Five to 15 percent of Ohio's corn crop is lost to disease each year, amounting to nearly $100 million in lost farm income. Corn diseases include seedling diseases, leaf blights, stalk rots, ear and kernel rots, and viruses. This bulletin describes the disease symptoms, provides color images, gives the environmental factors favoring the disease, the method of transmission and infection, and management options for the major diseases affecting corn in Ohio. Corn, Soybean, Wheat and Alfalfa Field Guide, Bulletin 827.Looking for a handy guide to take to the field to diagnosis various pest and production problems? This guide is the answer and is new for 2014! You will want one of these guides in the truck and maybe a second in the tractor. Ohio Agronomy Guide 15th Edition, Bulletin 472. The newly revised Ohio Agronomy Guide serves as the official compilation of adaptive results and recommendations from research and educational programs. Described in this manual is information on Ohio's climate and soil, soil and water management, soil fertility, and corn, small grain, and forage crop production and management. Also, seed evaluation and weed control for the previously listed crops are discussed.